If you do email marketing through MailChimp and your site uses WordPress, congratulations. You’ve already gone through the challenges of finding a domain name, getting hosting (we use WPengine), starting to publish content, and beginning to generate an audience. You’ve also signed up with MailChimp and started to think about how you are going to use email marketing to help grow your business. A lot of the hard work is done, and now you need to connect up the two platforms so that they talk to each other. So how does one set up MailChimp in WordPress? Here are a few ways to leverage it. Because MailChimp and are two very popular services, there is no shortage of plugins to connect the two. Here is MailChimp’s official list, but the one we use here is the aptly named MailChimp Widget. It integrates easily into sidebars to send email addresses directly from your pages to your mailing lists so that you can then email them. MailChimp for WordPress – a bridge between your site’s registration and your MailChimp lists. This plugin adds a checkbox that adds the registrant’s email address to your email list when they sign up. 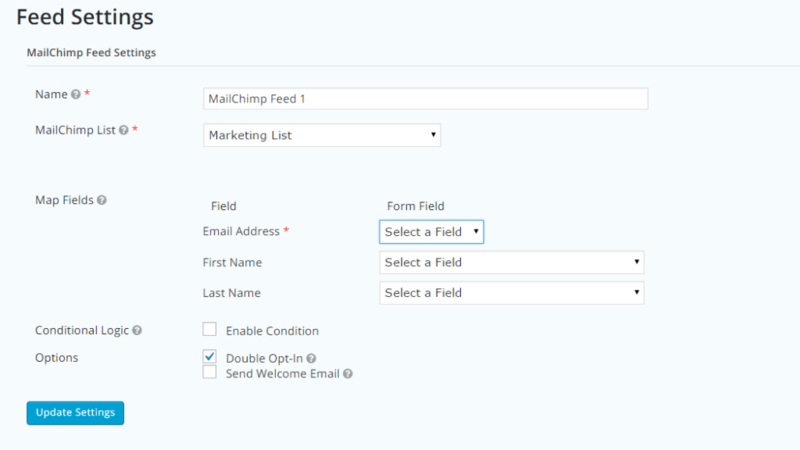 WooCommerce MailChimp – WooCommerce is an extremely popular ecommerce setup for WordPress, and this integration makes it easy to add customers from WooCommerce into MailChimp. We recently started using SumoMe here and I must say – we’re hooked. SumoMe is extremely easy to set up and allows for many different configurations and custom ways to show popups and different messaging depending on your user’s journey through your site. Analytics that show you the number of times the form was shown and how many subscribers you received. If you’re running a lead generation business through WordPress (like HireGun is), you should be using Gravity Forms. If you’re using Gravity Forms. did you know that you can integrate the two so that email addresses collected through your forms are automatically pushed to a MailChimp list? If you have a bit of technical skill, it’s entirely possible to roll your own MailChimp signup form using the WWSGD plugin and the raw HTML generated from a MailChimp list. Come back to WordPress and input the code into the Message to New Visitors and Message to Return Visitors fields. This way you can show a different message depending on how many times someone has been to your site. In the above, find the NBED parts and input your own values. The first one should come from MailChimp in the form code. The second is your own call to action. Hopefully this article has been helpful to you in figuring out how to integrate MailChimp and WordPress. If you need help with it, we have email marketers you can hire to help you get started!